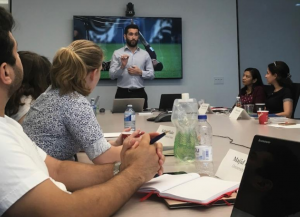 CCRM Australia is offering an opportunity for Australian trainees to attend Summer by Design, an international workshop hosted by the University of Toronto’s Medicine by Design initiative in partnership with CCRM and the Rotman School of Management. This two week placement runs from July 06–21st 2019 in Toronto, Canada, and focuses on skill development in the areas of clinical translation and commercialisation of regenerative medicine. Interested participants are to email Dr Chih Wei Teng at chihwei.teng@ccrmaustralia.com.au directly and further details including the application form will be sent. Applications will close on 1st March 2019. The international workshop placement is a unique offering as part of the CCRM Australia’s 2019 Training Program. CCRM Australia invites PhD candidates and Post Doctorate Fellows in regenerative medicine to participate in this international workshop. International travel to the workshop location, facilitated through a CCRM Australia travel award of $2500 (this will support flights, visas and health insurance). Medicine by Design, University of Toronto covers the cost of the workshop and accommodation for international participants on the University campus from July 06–21st 2019.